I would like to share a bit about my Italian hertiage with you, and from where my great grandmother immigrated. Calabria in Southern Italy is a beautiful and unspoiled Region surrounded by the Mediterranean Sea. Easily recognizable, forming the toe of the Italian boot, it has over 800 kilometers of coastline and is known as one of the hidden gems of the country. The coastline is one of the biggest draws with miles upon miles of pristine beaches and hidden coves. 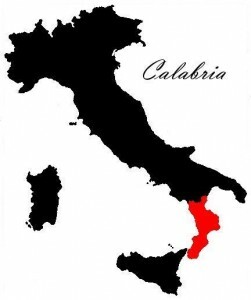 Calabria produces one-third of Italy’s olive oil and is second after Sicily in the production of oranges and figs. Eggplant is the leader of their vegetable crop, Calabrians eat it in varied ways sauteed in olive oil with garlic and parsley; coated in egg and bread crumbs and fried and stuffed with salted anchovies and bread crumbs. Although the Ionian Sea and the Gulf of Taranto are rich in tuna, swordfish, sardines, and anchovies, mountain cooking dominates the cuisine, and pork. There are countless salamis and sausages, as well as all manner of homemade pastas. Ever-popular Pecorino is made by every family that owns a sheep. The luxury of sweets is usually reserved for holidays. The food of Calabria is simple: pastas and vegetables, complimented by olive oil and sausages. Think of various shapes of dried pasta like spaghetti or penne topped with colorful sauces with combinations of tomatoes, eggplant and peppers. Italy is such a beautiful country and I hope one day I will get to go to Calabria and visit where some of my ancestors resided. Previous Post What About The Children? Thanks for sharing. I love cooking italian. My husband was there in rome for two years serving a mission…he more thinks he is italian…so make the dishes he likes from there.